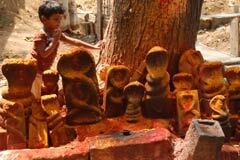 Every Friday is a festival day in the temple drawing huge numbers of devotees. Poornima puja (new moon day) Milk Abishek, 1008 lamp puja on the first Tuesday of each Tamil month are very devotionally celebrated in the temple. Goddess Badrakali graces as if She is on a procession to protect the world wearing Fire on Her had as crown. The temple is open from 6.00 a.m. to 11.00 and from 4.00 p.m. to 8.00 p.m.
Sri Badrakali Amman Temple, Madapuram, Sivaganga district. 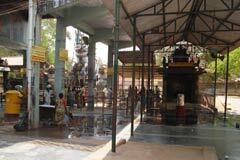 The temple is near Tirupoovanathar Temple praised in Thevaram hymns. Ayyanar is the custodian deity of the place. Lord Vinayaka is praised as Vinai Theerkum Vinayaka – Vinayaka who relieves devotees from their Karmas. Mother Badrakali is the family deity of almost all the people of the place, as She simply burns the effects of black magic and spells applied on Her devotees by enemies. She is also furious but grants all the courage to the devotees to stand the attacks of enemies. People firmly believe that Mother Badrakali would help them fight and succeed in their court affairs. It is common in this temple to see billionairs praying in the temple for business development. 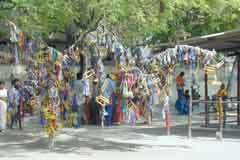 In olden days a group called Sami Aadigal use to play Kalari – a traditional event then. 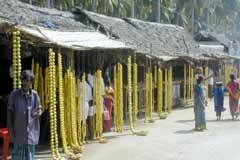 To soften the fury of Ambica, devotees offer garlands of lime fruits. They also offer Sari to Mother. Wearing the crown of Fire and holding the trident downward, Mother Badrakali appears as a deity of destruction of evils. The trident destroys evil. The fire on the head prevents the re-emergence of the evil and reduces them to ashes and Her standing posture shows Her merciful readiness to protect the devotees. The mount on which Mother Shakti stands is long and wide. There also stands a horse ready for a war with its front legs up and the back legs pressed on the ground telling the might of the Mother. 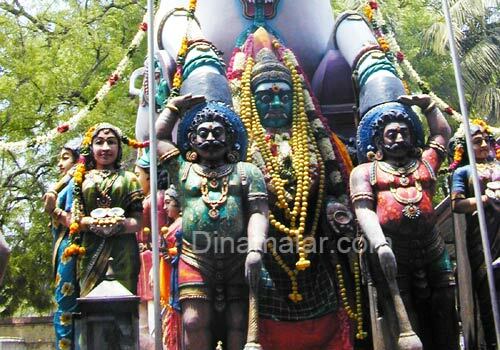 Ayyaanar is the custodian deity of the temple. People consider Him as the ruler of the place. 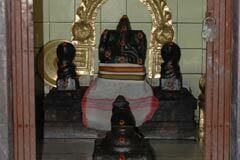 While Sri Ayyanar is seen on a Horse Vahan generally in other places, He is in a standing posture in this temple. This is a very ancient temple of this region, situated northeast of the Tirupoovanathar temple amid a pleasant and green environment. 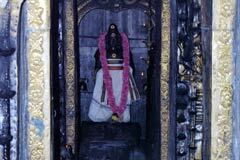 It is the belief of the devotees that the very name of Madapuram Kali would shake the miscreants. This is a very famous temple in the district. During the pralaya- the great destructive tsunami, Madurai was inundated by water and disappeared. Mother Meenakshi requested Lord Shiva to draw the borders of Madurai. Lord Shiva took of the Adisesha from His neck and rounded off Madurai. He drew the borders with Tiruvedagam in the west, Tiruparankundram in South, Tirumalirunjolai in north and Madapuram in the south, thus joining the tail and face of the divine serpent. Mother swallowed the venom of the snake and became furious. Ayyanar offered His horse to Ambica to give Her a cool shade. 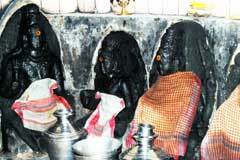 Hence Ayyanar is praised as Adikalam Katha Ayyanar. 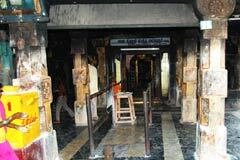 Mother Badrakali in this temple is taking care of the welfare of Her devotees. Miracle Based: Mother Badrakali graces the devotees wearing a crown of Agni-fire in a standing posture. Bus facilities are available to Madapuram from Madurai and Sivaganga. 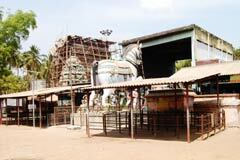 The place is 19 km from Madurai and 30 km from Sivaganga.